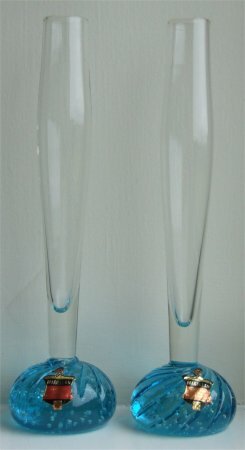 These vases are approximately 208mm (8 3/16ths inches) tall. They have small bubbles that come up in a very loose spiral but are almost random. 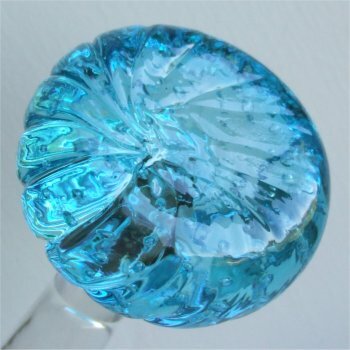 The bases are a flattened ball shape and are divided into fourteen lobes which are twisted into a tight spiral. The bottom of the base is level but the spiral lines continue to the underside (see image below). The stems are bulbous and are approximately 22mm (7/8ths inch) across the top. 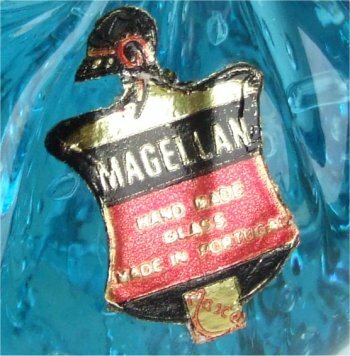 The labels are a metalic red gold and black, stating "MAGELLAN HAND MADE GLASS MADE IN PORTUGAL" (see image below). 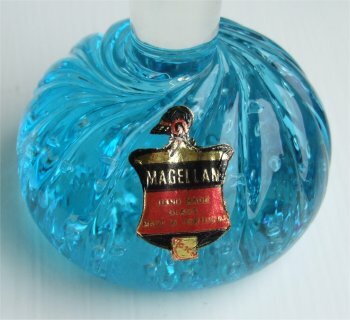 The bases are turquoise with clear stems.